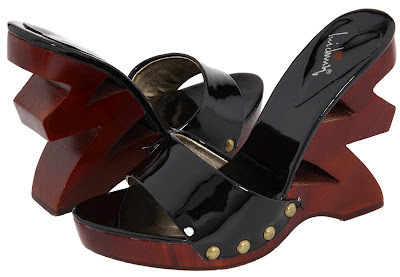 Shoes with character are so my thing especially if it pairs a classic style vamp with an unconventional heel and the architectural heels on this Luichiny Jeanna Jean Sandals are so full of character, verve and personality. Knock everyone socks off when you add these slip-on sandals to your look. Featuring a glossy patent leather upper with studding at platform and the beguiling carved wood heel, these 4 1/4" heel with 3/4" platform will get tongues wagging. And because these are by Luichiny, you can have these stunning works of art for less than $70.00. For those who want more color in their lives but still love this style, it also comes in fuchsia, red and white (though you have to hunt for those colors).